Calling all fairies and goblins! The Dublin Shakespeare Outdoor Theatre Festival organises a series of free performances of Much Ado About Nothing staged by Fortune’s Fool Productions from August 7-17 atIveagh Gardens. This modern take on the 400-year old play is suitable for all ages, and audiences are encouraged to bring picnics and blankets and make a day of it. All children love music, so why not bring your little ones along to two outdoor performancesof classical music? 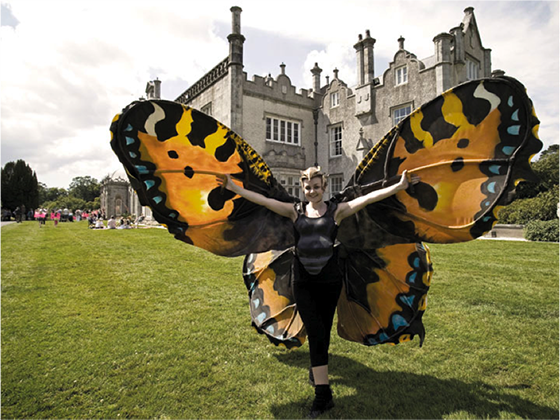 They’re taking place in the The Enchanted Garden at the Orangery, in the grounds of Killruddery House on August 10. Elsewhere that same day, fairies and goblins are taking over the country. Brigit’s Garden in Galway is holding an Elves & Fairies Day that Sunday. The Fairy Queen and Elf King invite fairies and elves to join them for sharing stories, songs and music, with fairy dancing, a forest treasure hunt and scary face painting on the day. On the east coast, you can walk the Fairy and Goblin Trail and sit the munchkins down for the Children’s Tea Party at Burtown House. All knights and princesses, fairies and trolls, dragons and wyverns welcome! Down at Newgrange Farm on Saturday August 16 it’s Scarecrow Day, where your little DIY enthusiasts could score a money-and-toys prize in the scarecrow competition. If they’re into funny-looking insects, Powerscourt Gardens organise The Bug Walk with Dale Treadwell on August 24. But if all you want to do is organise your own little stage production in your garden or a magical garden party for the kids, check our Pinterest for lots of cool ideas. We haven’t forgotten about the grown-ups. Head here for things to do outdoors if you are past your teens! Posted in CultureTagged garden, kids, thingstodoBookmark the permalink.